Pioneer Square in Seattle is a very significant part of downtown and is a must-see on your next trip to the Northwest. I don't know of too many big cities across the United States that can boast of having preserved their original downtown areas, but luckily for us, Seattle has been able to maintain the Pioneer Square District, and now it is definitely one of the hot spots of the city. So what do you need to know about the Pioneer Square District? Well, for starters, many people don't realize that Pioneer Square can be considered to be the beginnings of modern Seattle. Granted, the Denny party first landed in Alki Beach in West Seattle, but many of them ended up relocating to what is now Pioneer Square in 1852 and there the city was born. When the Pioneer Square district was first built, all the buildings and structures were make out of wood, but that would prove destructive in 1889 when a fire broke out at a cabinet-making shop and ended up burning nearly 25 city blocks and causing damages of about $20,000,000. Luckily, the economy was pretty good at the time and the people in Seattle decided to rebuild the city and instead of rebuilding with wood, they decided (thankfully) to use brick and stone. To this day it still retains a bunch of the same type of architecture which makes Pioneer Square a great place to see and visit. So now that you know a bit about how Pioneer Square in Seattle came about, you're asking yourself what there is to do? Well, the first thing to realize is that it hasn't traditionally been known as a place for families and kids. There are tons of sports bars, nightclubs, bookstores, and art galleries in Pioneer Square. There is also some pretty good shopping, especially if you like the more independent and unique-type shops where you can find some "interesting" gifts. Probably the most interesting thing to do in Pioneer Square is to take the Seattle Underground Tour. It can be a little cheesy at times, but it's definitely an interesting look at what Seattle was after the Great Seattle Fire. Seattle was a popular place during the Klondike gold rush of the late 1890s and this United States National Historical Park commemorates this. There are actually three different commemoration locations, with three of them located in Alaska, and the fourth one right here in Pioneer Square at 117 South Main Street. You can visit for free to get an interesting look at what Seattle was like during the gold rush. The totem pole can hardly even be considered an attraction because it's become such a common sight among both residents and even tourists to the area. 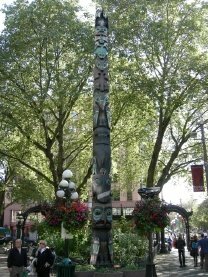 This 50-foot tall pole is a replica of a totem pole that was burned in 1937. If you need some rest from walking around, head on over to South Main Street and Second Avenue South where you'll be able to relax at the Waterfall Garden Park, an outdoor area with a 22-foot artificial waterfall. So now that you've got some ideas of some things to do at Pioneer Square in Seattle, what are you going to choose? If you're sure you want to stay in or around Pioneer Square on your next trip, be sure to check out some of the Pioneer Square hotels close by. Or, if you love it so much that you want to stay here permanently, check out some of the Seattle Pioneer Square apartments that you can rent and some things to keep in mind. Return from Pioneer Square in Seattle back to Seattle Tourist. Have A Great Story About This Place? Do you have a great story about this place? Share it!